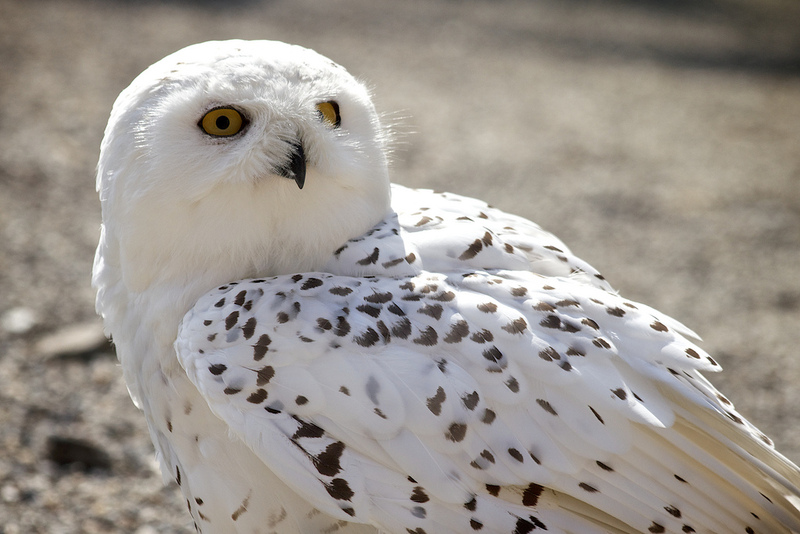 Snowy owls are popping up all over the eastern United States and Canada. One even made it to Bermuda. Biologists aren’t sure why. Perhaps a summer lemming boom fed many more snowy owlets than usual? Whatever the reason, remarkable numbers of Hedwig’s kin have come south. If you’d like to see one in the wild, now is the time. Keep an eye out at airports, the beach, fields, and other open areas that remind owls of the tundra. But they could show up anywhere, like this one at a Maryland McDonald’s. For more info, check out this e-Bird summary and a zoomable map of reported sightings. P.S. I took a little break from blogging for an exciting personal project. Hope to do more in the new year. Based on a New Yorker article by best-selling writer Jonathan Franzen, EMPTYING THE SKIES chronicles the poaching of migratory birds in southern Europe and introduces us to the intrepid volunteer squad of bird-lovers trying to stop it. 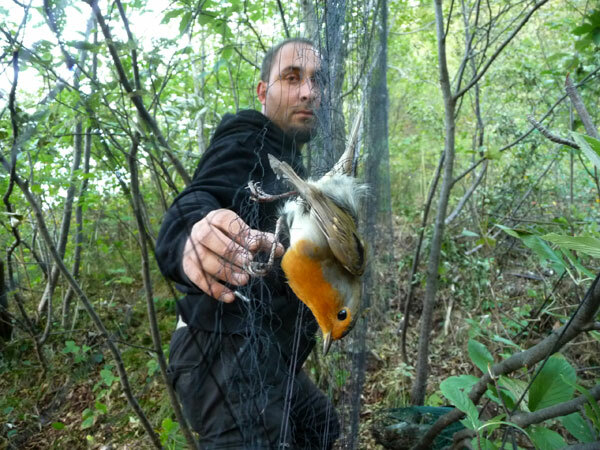 Trapped at “pinch points” near the Mediterranean, these globetrotting songbirds are considered culinary delicacies and reap big bucks on the black market, yet many species are endangered and some face extinction. Directors Douglas and Roger Kass skillfully translate the spirit of Franzen’s words onto the screen and deservedly win this year’s Zelda Penzel Giving Voice to the Voiceless Award. For more about the film, check out its Facebook page. B95, aka Moonbird, has again touched down in Delaware. After refueling on the eggs of spawning horseshoe crabs, he will head north to the Canadian arctic for at least his 21st breeding season. 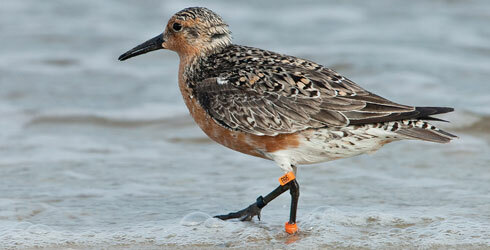 Remarkable for a four-ounce red knot whose normal lifespan is just four or five years and whose annual migration begins and ends way down in Tierra del Fuego. B95 has logged at least 340,000 miles over the years, probably more. That’s enough to go to the moon and halfway back, hence his nickname. He’s even got a biography by Phillip Hoose, who took the lovely portrait above. For another lovely murmuration, see this post. The World’s Most Traveled Bird? B95, aka Moonbird, has again touched down in New Jersey. After refueling, he will head north to the Canadian arctic for at least his 20th breeding season. Remarkable for a four-ounce red knot whose normal lifespan is just four or five years and whose annual migration begins and ends way down in Tierra del Fuego. B95 has logged at least 320,000 miles over the years, probably more. That’s enough to go to the moon and halfway back, hence his nickname. He’s even got a biography coming out this summer. When Should You Stop Looking for a Possibly-Extinct Species? When you’ve found two of everything else. That’s the conclusion of a fascinating, if disappointing, paper about the ivory-billed woodpecker in the latest issue of Conservation Biology. Most experts believe the “Lord God” bird was driven to extinction in the middle of the twentieth century. Occasional reports of sightings, however, have kept some hope alive. A report from Arkansas in 2004, for example, inspired detailed censuses of several areas with promising habitat. Sadly, no unambiguous evidence of IBWPs appeared. We evaluated whether the census efforts at these localities were sufficient to discover an Ivory-billed Woodpecker if it had been present and derived a practical stopping rule for deciding when to abandon the search in a particular site. An efficient stopping rule that incorporates rewards of discovery and costs of additional sampling should be triggered at the smallest sample size q satisfying f1/q < c/R, where f1 is the number of singletons (species observed exactly once during a census), c is the cost of making a single observation, and R is the reward for detecting each previously undetected species (Rasmussen & Starr 1979). 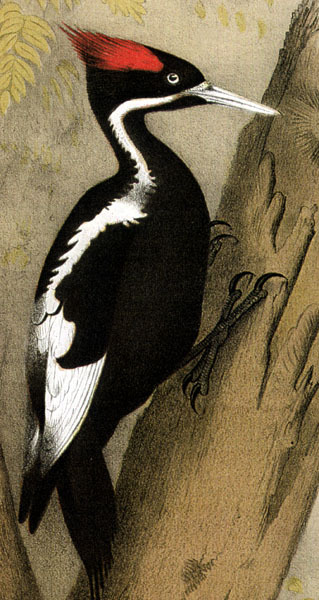 Because R for an Ivory-billed Woodpecker is extremely large relative to c, c/R is close to zero. Thus, a simple, empirical stopping rule is to stop searching when each observed species is represented by at least 2 individuals in the sample (f1= 0). The same stopping rule can be derived independently from theorems originally developed by Turing and Good for cryptographic analyses (Good 1953, 2000). 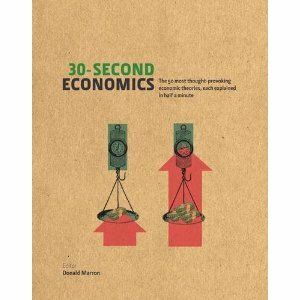 Both derivations imply that when f1= 0, the probability of detecting a new species approaches zero. We applied this stopping rule to the census data for the set of species that regularly winter in bottomland forest, such as the Ivory-billed Woodpecker, which was sedentary and occupied year-round territories. According to that stopping rule, the search should be called off at one location (Congaree River, South Carolina) and is close to hopeless in the other three (Choctawhatchee River, Florida; Pearl River, Louisiana and Mississippi; and Pascagoula River, Mississippi). Based on these and other data, the authors conclude that the probability that ivory-billed woodpeckers still inhabit the southeastern United States are less than 1 in 10,000.